The Dog Daddy at our house had a birthday recently and his favorite gifts were from the dogs! In fact, he liked a couple of them so much that I thought I'd share them with you. This yellow Labrador Retriever / Golden Retriever dog soap was a bit hit, especially since it came from Jeffie and Rudy! 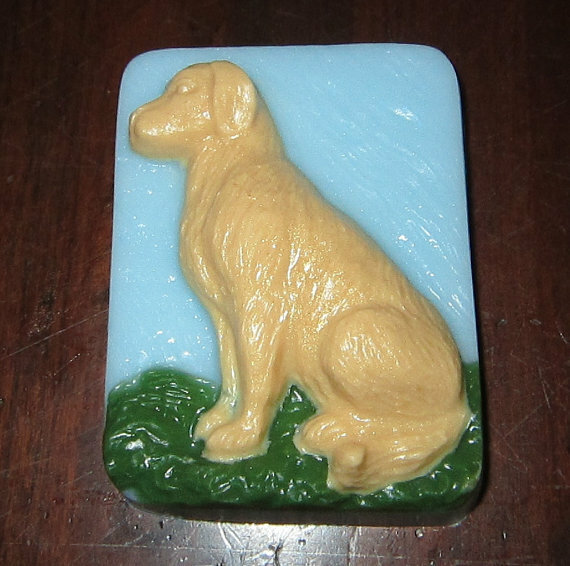 This soap is beautiful and would make a fabulous gift for any retriever dog lover. A great hostess gift, too. Handmade by Tricia Samundsen / Scentability, each soap is hand poured using a detergent free glycerin soap base. She offers her dog soap bars in black Lab, chocolate Lab and Golden Retriever. You pick the scent from a long list of available scents. The Dog Daddy's soap is Intuition for Men and smells great! These soap bars are generous in size - almost 3" x 4" - and very reasonably priced at $5.75. We love supported small artisan businesses and are definitely partial to handmade goods. Fetch your own beautiful dog themed soap from Scentability at their Etsy Shop. Scentability also offers soap for dogs in lavender cedarwood scent and soaps in goat, lamb and pig themes! 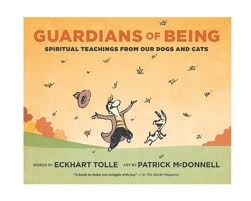 Eckhart Tolle and Patrick McDonnel's book Guardians of Being was another favorite gift from the dogs. With words by Tolle about the spiritual teachings from our dogs and cats, and illistrations by McDonnel, creator of MUTTS comic strip, how could this book not be a favorite?! 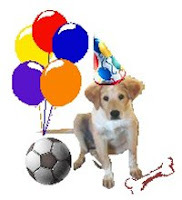 Watch for a guest blog post book review soon from the Dog Daddy who has some pretty good dog shoppers! Happy belated Birthday to Jeffie and Rudy's Daddy! What great gifts! I just love the soap!